West Ham United have indicated that Marko Arnautovic is not for sale amid the recent transfer interest from the Chinese Super League. 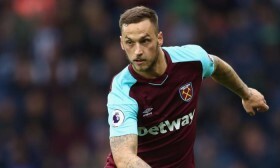 Arnautovic's brother and agent Danijel had recently fuelled speculation regarding the Austrian's future after urging the Hammers to sell him to the Far East where he can compete and secure trophies. However, in response, the Hammers have stressed that Arnautovic is not for sale and they expect him to honour the remaining length of his contract, a statement read: "Marko Arnautovic has a contract and we fully expect him to honour it." Arnautovic had been on the sidelines during the festive period with a hamstring problem but he has impressed on his comeback with three goals in as many appearances. The Austrian is expected to lead the line for the Hammers on Saturday afternoon where they are scheduled to entertain Arsenal at the London Stadium. The ex-Stoke City man has rarely been on the winning side against Arsenal but he has recently impressed against them with goals in back-to-back games.